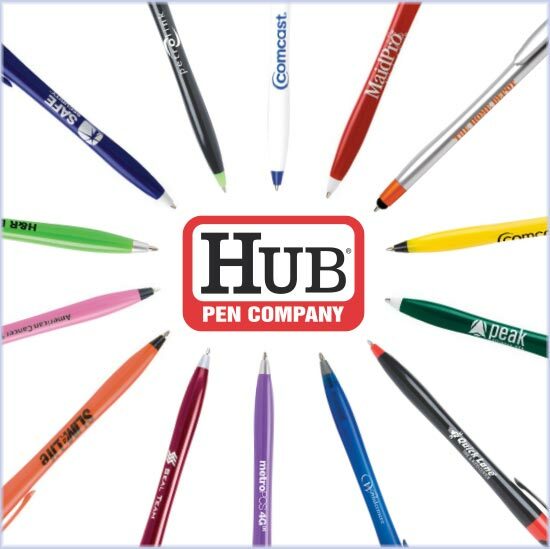 Printcom is one of the largest distributors of HUB Pens in the Northwest! That’s good news for you, because we can pass along our great quantity discounts to you and your business. We have personally inspected scores of top selling pens, and we know which ones are the highest quality, smoothest writing and most reliable. Need your pens right away? We offer quick turnaround with no rush fees. Need a pen with a certain feature, like a stylus, LED light, soft grip, or anti-fraud ink? We can help! Let us know what you’re looking for, and we’ll point you in the right direction. Check out some of our favorite pens below, and give us a call for questions or to place an order!